You’ll need a food processor for this one. And like five spare hours but the actual making part is really easy, it’s just the waiting that takes time so line up a few good films and disappear every so often to check on the status of your biscuits. Pulse the flour and butter together in the food processor until the texture resembles fine crumbs. Add the sugar and egg yolks and pulse until you have a smooth dough. I had to stop the mixer once or twice to scrape the sides and bottom of the bowl down to make sure everything was incorporated. Take out 1/3 of the dough and set it aside. With the remaining dough, add the vanilla and pulse until combined. I used vanilla extract paste and I’m so glad I did – nothing beats the little give-away flecks of vanilla seeds! Place this larger portion of dough in some cling film and leave it out on the counter. 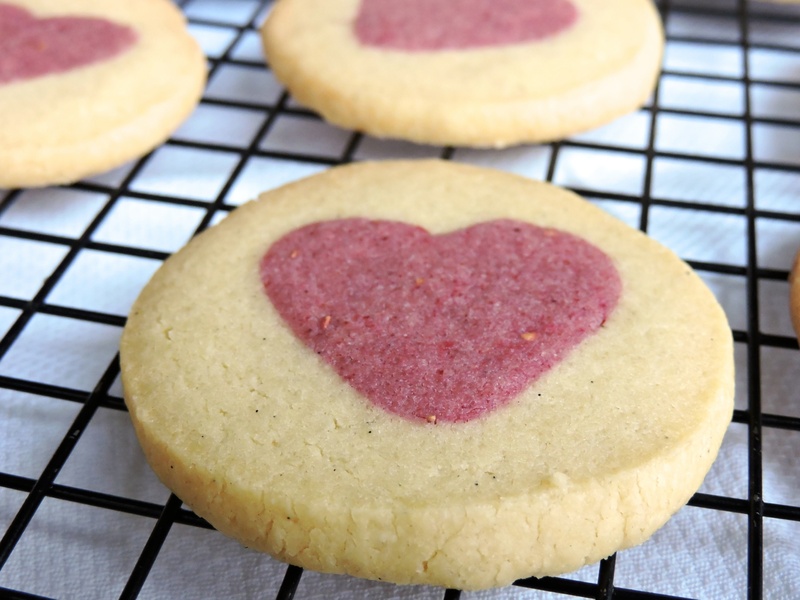 Pulse your freeze dried raspberries or strawberries until finely ground. You may have the odd seed here and there but that’s fine. Add the smaller portion of dough to the mixer again and add the raspberry powder and food colouring. Pulse until combined and continue adding food colouring until you’re happy with the colour. If you want to keep things natural, then you could hold off on the food colour full stop and just use more freeze dried fruit. Roll the coloured dough between parchment paper, keeping it fairly thick. 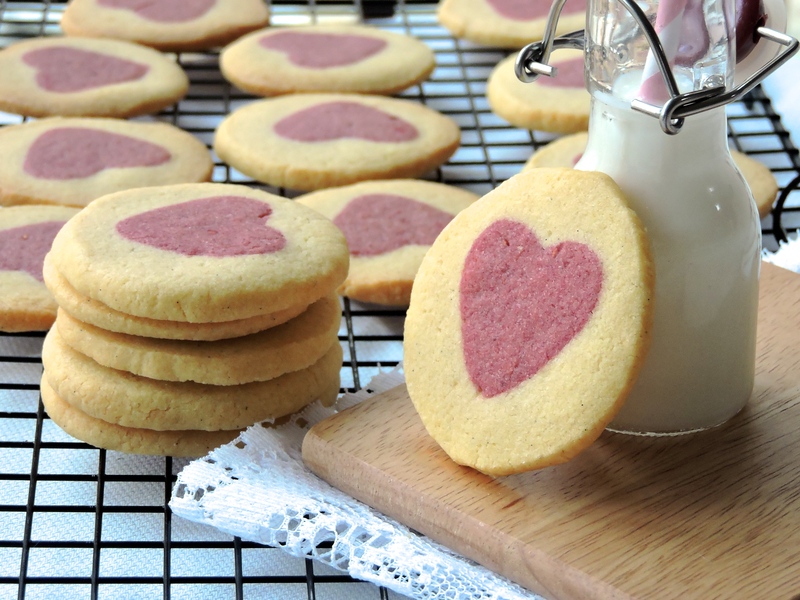 Using a smallish heart shaped cutter, cut out little shapes and stack them on top of each other evenly. 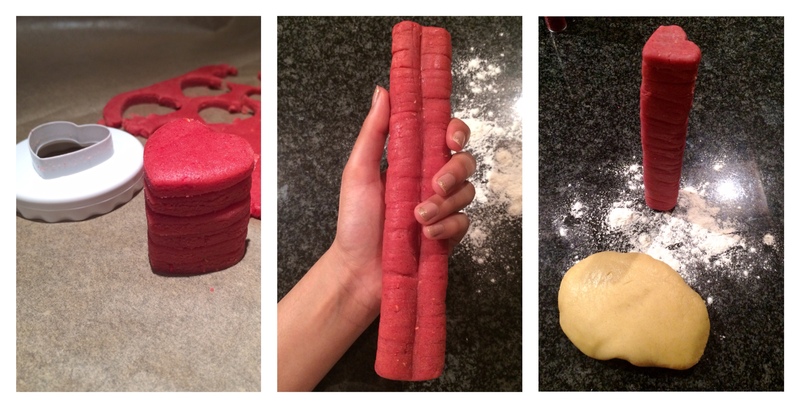 Continue re-rolling and cutting until you have used all the coloured dough and you have a long heart shaped cylinder. 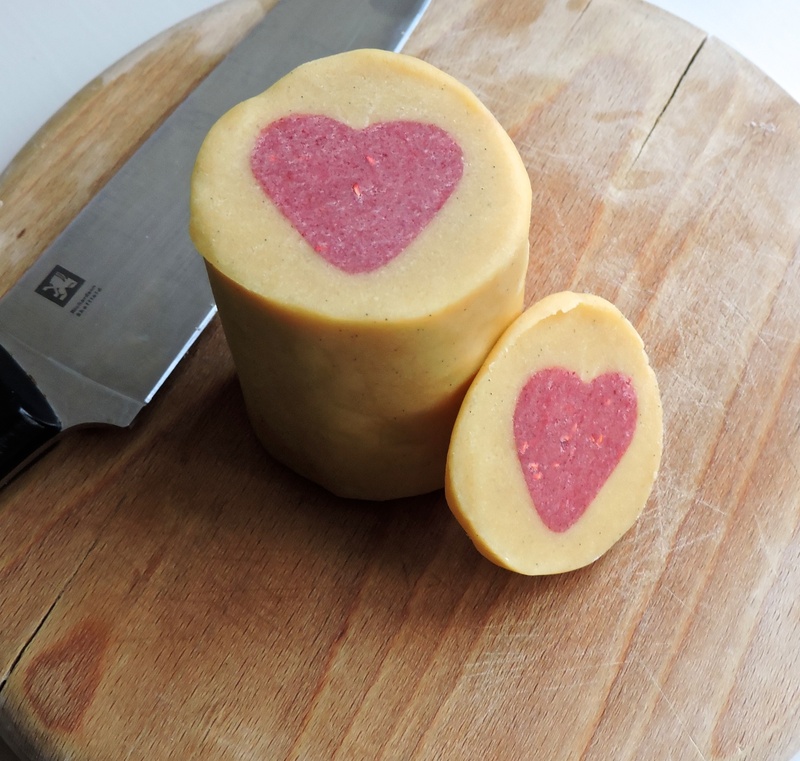 Gently press the ends together to seal and wrap the heart shaped column up in cling film and put it in the freezer for 2-3 hours until completely firm. 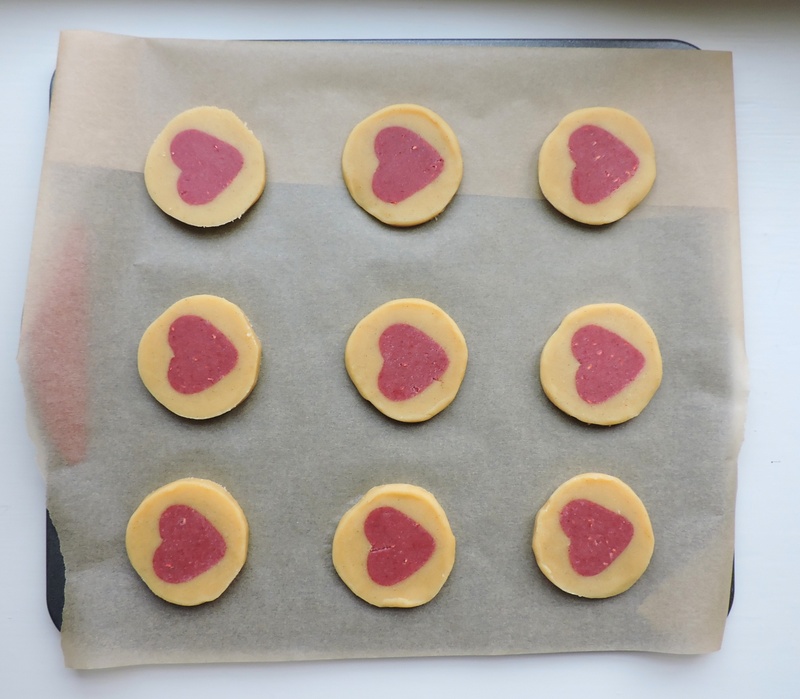 Once firm, remove the hearts from the freezer and split the rest of the vanilla dough in to three pieces. Roughly roll each piece in to sausage shape, about the length of the heart shaped cylinder and pack it on the top and sides. 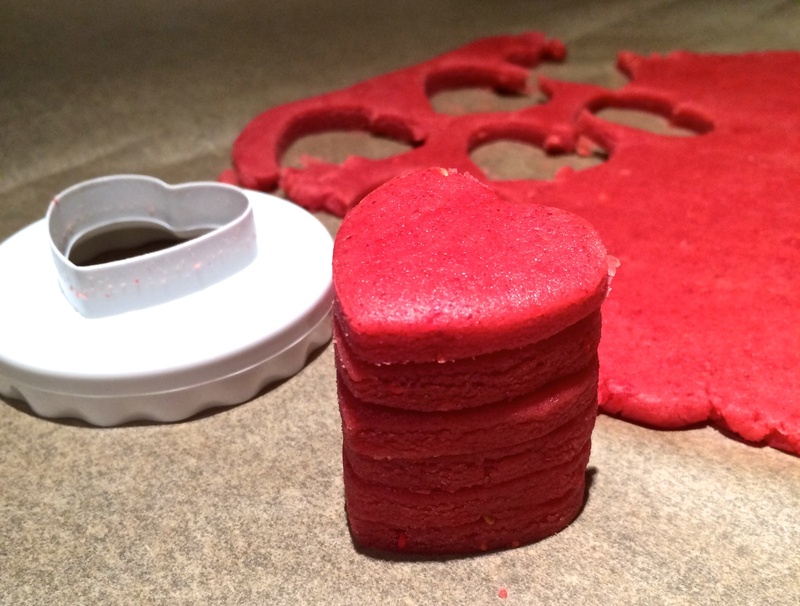 Roll the dough in to a large and smooth cylinder shape on a floured surface, ensuring the coloured dough is well hidden on the inside. Wrap the whole thing up in cling film and let it rest in the fridge for about 2 hours. Pre-heat the oven to 150FAN and place a rack in the lower half of the oven. You don’t want the biscuits to be near the top as they will brown and lose the contrast between the colours. Remove the dough from the fridge and trim off the end pieces. You’ll be able to see the secret heart in the middle (hurrah!). Cut the dough in to 1/2 cm rounds, or thicker if you want thicker biscuits, and place them on a baking sheet lined with parchment paper. Bake for about 15 minutes until just golden on the outside. Leave to cool on a wire rack until firm. If you don’t want to bake all the biscuits, cut off as many as you need and wrap the rest of the log up and freeze it. Take the log out an hour before cutting and baking. Hope you saved us some! 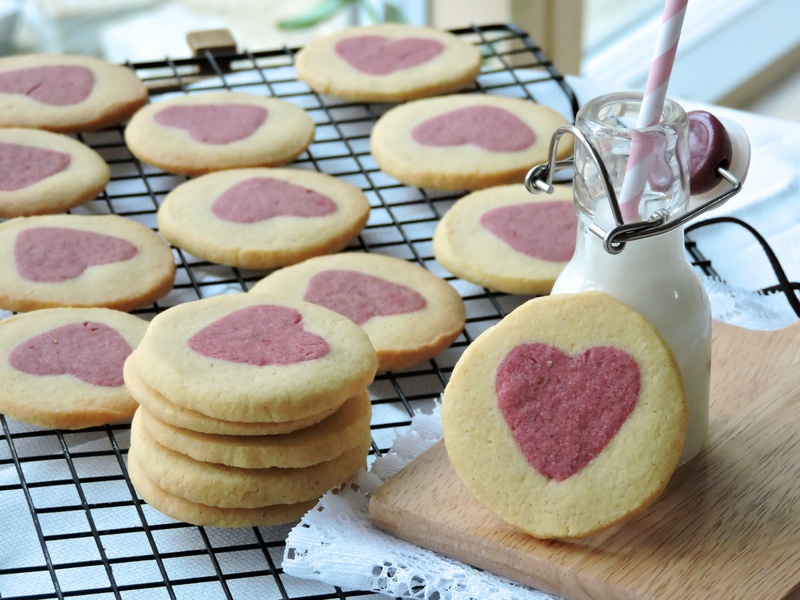 These cookies look lovely. If I don’t get around to making them today, I will save the recipe for next year. Thank you for sharing. No problem! They’re definitely worth it! Oh wow…these look amazing! And the addition of the raspberry… Mmm..!! 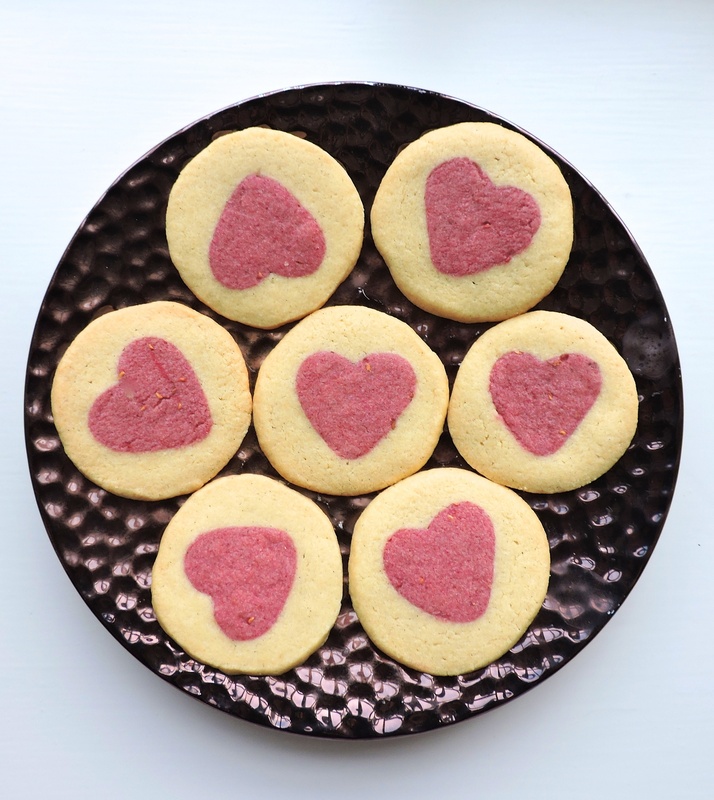 I saw some hidden heart cookies on someone’s Facebook feed and was wondering how they did them… So glad you shared this! I think you should give yourself more credit; I graduated last summer and and actually put off food blogging until I finished uni because my brain couldnt handle dealing with anything more than essays and binging on American comedies. So you are doing way better than me and a lot of other student types out there! P.s loving the recipe and the blog! haha thank you! I actually really like the balance of blogging and uni, it’s a good stress reliever! Hopefully I can keep it up, although there’s a lot on the horizon with uni over the next couple of months so we’ll see how well Bakedbyh survives! Love these. You have a ton of patience! !